Tonight the Art with Heart team girls are sharing some wonderful ideas to inspire you with our Designer Series Papers. 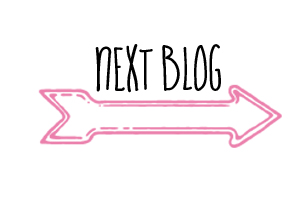 This month is the start of the new Stampin'Up! year and we have a special promotion on our Designer Series Paper, buy 3 get 1 FREE for the months of October and there is no limit. You have come from the lovely Caroline Manwaring Hops are full circles, so you can start hopping here and then at the end of each post is a link to the next one. There is also a list of participants at the end in case of any broken lines. Now let's get started! sit back grab a cuppa and enjoy some time out of your busy day. 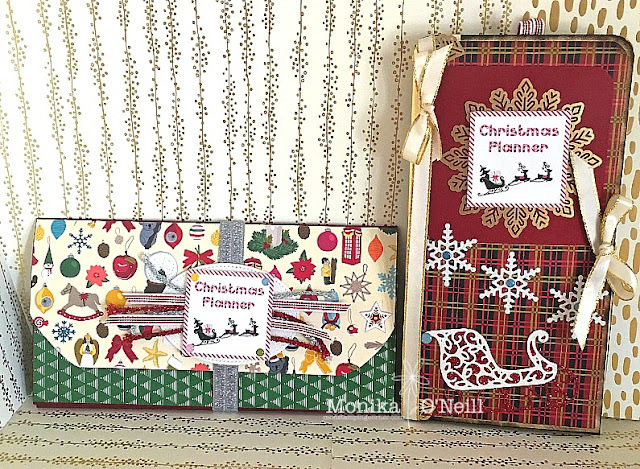 Christmas is not that far away so I thought I would make two Christmas Planners. The first planner I just followed the instructions from u-tube using a Manilla Folder there are a lot of videos to choose from. 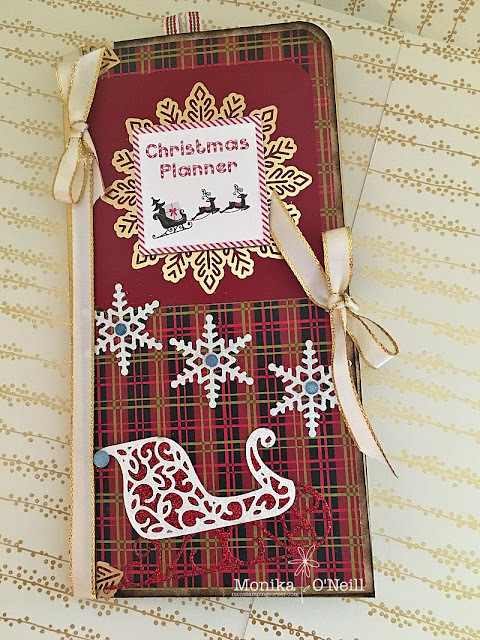 The second planner I made I used the instructions also from utube. Shopping list plus more you get to down load for free. I used regular copy paper to print them out and cut to the size you want. 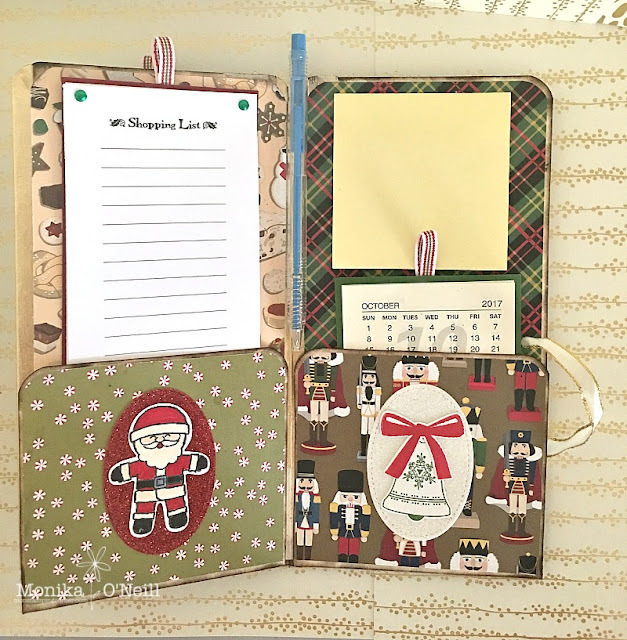 I used Cherry Cobbler and Garden Green as mats for the lists, I had the red & green brads in my stash for a long time. I attached a small piece of Quilted Christmas Ribbon behind each card to make it easy to pull out. Before attaching panels together I stuck sticky tape along all the folds and gold washi tape over that, just to prevent wear and tear from use, I then adhered all the layers of DSP and sponged around the edges to cover as much as the manilla folder as I could. Add tear tape on each score line on the 4inch panels and a little liquid glue, as you will be pulling and putting things in and out this gives a bit more strength to the sides. There are two ways you can have this planner either all panels fold out or stick the 2 middles pieces together as I have done, it opens more like a book and easier to handle if its in your bag. I punched a hole on the front and back cover only and threaded the ribbon through to tie a bow. The Christmas planner logo was a free download also. Then you decorate to your liking. This is the first 2 panels when you open the planner. 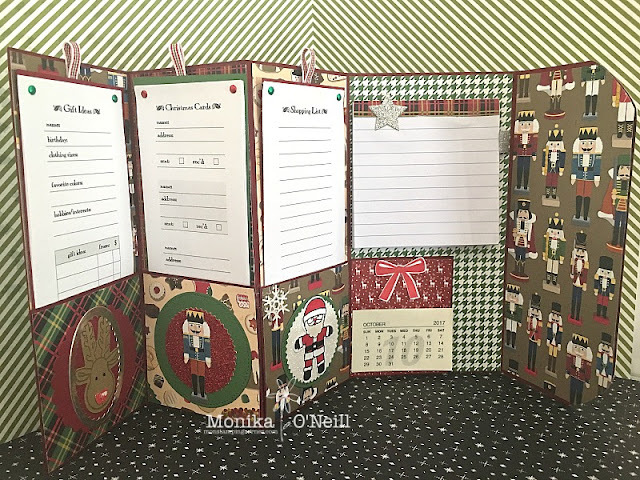 Planner number 2, I used the same DSP pack (it's my favourite one so far) This one is bigger as it has one extra panel and the fourth panel is extra wide. I used Cherry Cobbler for the base the base, and I followed the utube tutorial. 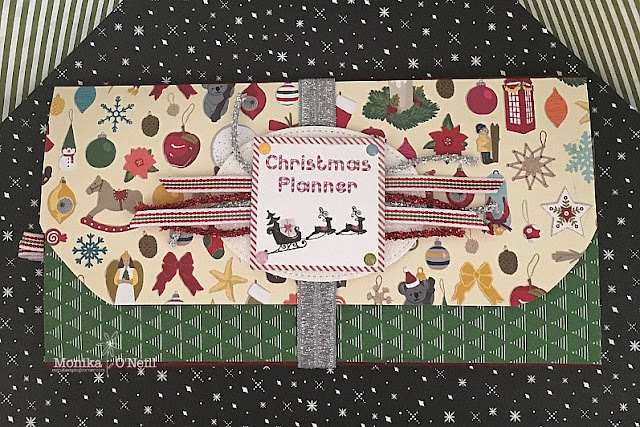 I made the belly band using silver elastic from the $2 shop, then used one of the oval stitched framelit from dazzling diamonds and cut silver and red tinsel and the christmas quilted ribbon and glued those on and used dimensionals for the Christmas planner attached that. 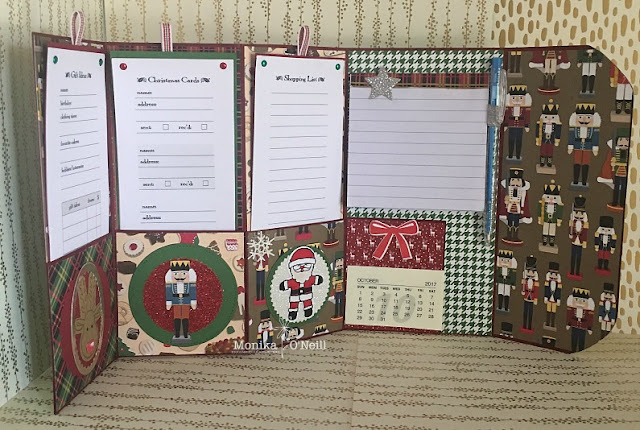 A close up of the various Christmas inserts. This planner is larger than the first one it has an extra panel. You're certainly organised for Christmas early. Looks great. Wow Mon, more amazing projects and thanks for showcasing this DSP! where can i buy one of those? they are great. Wow what a fantastic idea! love theses projects Mon! Wow Mon, these are really awesome! Great job! So cute! That would even make a great wedding gift addition. 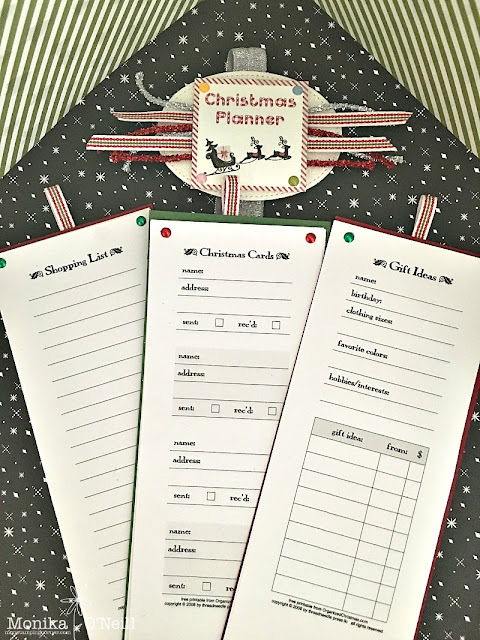 Hello and WOW I just love your idea would you share where you the link came from for the Christmas Lists.